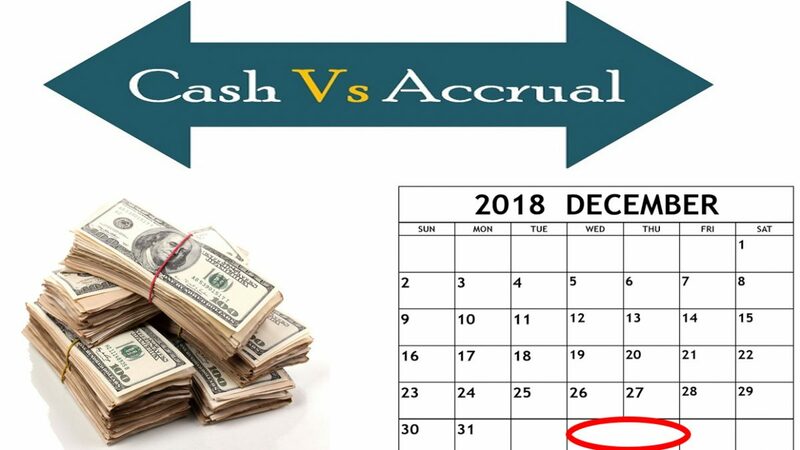 Cash versus Accrual, which one do I choose? Knowing the difference between cash and accrual is a good first step. Step two is knowing when it matters which one you use. Cash and accrual are accounting methods. They are used when you are reviewing your financial statements, and when you are reporting your income to regulatory bodies like the IRS and the department of revenue as well as investors, lenders, and partners. Cash means you consider income earned when it actually received. Accrual means you consider it earned as soon as you create the invoice. For tax reporting purposes, you cannot go back and forth, you select one and stick with it. When you are reviewing your financials, you can go back and forth, which you might want to do to get a better picture of your actual financial position. To clarify, here is an example. Cathy’s Catering has a client who ordered a $100 cake in December of 2017 for Valentines day 2018 and paid a 50% deposit ($50.00) with the balance due on Feb 14th when the cake is delivered. If she is a cash basis taxpayer, she would show $50 earned in December 2017 and $50 earned in February 2018. If she is an accrual basis taxpayer, she would show $100 earned in December 2017 for which she would have to pay taxes on the entire amount even though half it is hasn’t been received yet. So why would someone want to do this? There are a number of reasons why, but typically it has to do with gaining the best tax advantage. Usually an accountant or financial planner is the best person to advise you on this. If you need a referral, please give us a call because we know many accountants and financial planners in the area and would be happy to provide a referral for you.